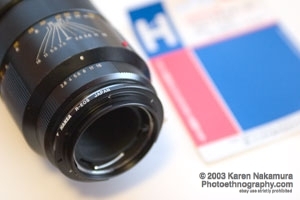 Many people use their classic Leica R lenses on digital SLRs (such as Canon EOS and Panasonic Lumix series cameras) with widely available lens adaptors (see CameraQuest.com for a source in the USA). For example, I use my Leica R lenses on my Canon EOS, Ricoh GXR, and Panasonic Lumix Micro-four-thirds cameras using a variety of adaptors. In the case of R-lenses, it does not matter if you have 1, 2, 3, or ROM cams if you are using it on another camera since you will always be shooting using open-aperture metering. The system works fantastically well. I have some photographs using the 180mm Elmarit on my gallery page. You can also easily adapt Hasselblad V system lenses for the Canon EOS camera as well as other lens mounts. Will it fit? In order for an adapter to work, there are two factors. The first is the body "lens registration" distance or the distance from the lens mount to the film surface (some people also call this the flange-back distance). The second is the mount "throat size" or the diameter of the mount. For an adapter to slip in between the body and lens of differing manufacturers, the registration distance of the lens must be greater than the registration distance of the body; and the throat-size of the lens must be smaller than the throat size of the body mount. I've sorted this chart by increasing lens registration distance. Note: Don't copy without asking! Using the text or images on this site in an ebay auction is a violation of your ebay Terms of Service. Notes on Auto-focus/Manual focus / Auto-Exposure : While you can adapt many older manual-focus lenses for use with auto-focus cameras (especially the Canon EOS series, because of its short lens registration distance), you cannot easily adapt auto-focus lenses from one series such as the Minolta to the Canon. One reason is because the camera body cannot control the lens aperture. For example, if you mount a Nikon SLR 'G' series lens (which doesn't have an aperture dial) on a Canon EOS, you can only shoot the lens wide open. You can't stop down at all. You're better off selling off your auto-focus lenses and then buying the equivalent in the other series. Micro Four Thirds as the Universal Receiver? Many classic camera enthusiasts are realizing that micro four-thirds (MFT) digital camera bodies can be adapted to take almost any classic camera lens. This is because the registration distance of the MFT system is a slim 20mm -- thinner than even the Leica screwmount's 28.8mm! This means that adapters can easily be made to convert from Leica M mount, Leica screwmount, Nikon rangefinder mount, Pentax screw and K mount, etc. etc. etc. to micro-four-thirds. For more information, please see my pages on the micro-four thirds system. M42 to EOS, Leica R to EOS, and Nikon F to EOS Adapters? In addition to my Leica R adapter, I have an EF mount adaptor for my M42 (Pentax/Praktica) screw mount lenses. In particular, my Super-Takumar 50mm f/1.4 and 135mm f/4 lenses are spectacular. With my Spotmatic SPII not the most reliable or handy camera, a lens adaptor is great. My EOS-3 can meter the lens in stop-down mode, which isn't any more inconvenient than the stop-down metering of the SP II anyway. For fun, I also bought a Hasselblad C to EOS adapter too. What is annoying about the EOS series is that they do not support AF focus confirmation with manual focus lens adaptors. This is unlike the Pentax and Nikon digital cameras which retain that feature with manual focus lenses. This is a serious issue since the plain ground-glass focusing screens in most AF cameras are not suitable for accurate manual focusing as they do not have split-prism or other focusing aids built into them. OK, so I thought I was intense about cameras, but some folks in Germany have hotwired an EOS-M42 adaptor with the electronics from an EF35-70 lens to get an adaptor which supports MF focus confirmation. Nuts! Japan: Hansa - maker of classic camera accessories such as hoods, etc. Many thanks for your sides at Photoethnography, many good points and observations. As a happy amateur photographer I use a lot of aged, perfect tools. Analog hobby gives so much more. Since I from boyhood have used Kiev rfs since I could not afford Contax, however my grandmam photographed with hers. When I starded earning my own I bought a pair of prewar Contaxes, and in the 90s I got my G contaxes. As I read your Adopter page I missed info om Panflex, Visoflex II (S 39- M B). Here are my additions, measured with a good digital Caliper om my cameras and lenses.